I am very pleased to tell you that a new project on tourist/macaque interactions is going to be conducted at the field site soon. This project is an interdisciplinary anthropological study of ‘primate tourism’. 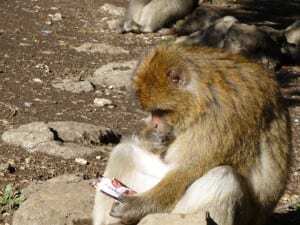 We aim to develop biological and social anthropological approaches to understand how tourism influences primate societies and how to reduce or eliminate negative effects of tourism on primates. 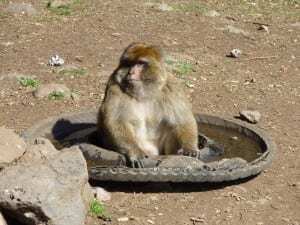 As you may already know, the Barbary macaque species is listed by IUCN as an endangered species. This project will make an important contribution to wildlife conservation locally, nationally and even internationally, as this study will be widely applicable to other scenarios where humans and animals coexist and interact. A few months to wait and we will tell you all our adventures with a new team and the new study group of Barbary macaques. I hope you can follow step by step the development of the project through the stories of our fieldwork with some pictures of the tourist area and the macaques to have you itching for further news. Bounty monopolising the principal water resources at the tourist area! !